Two K4s past their glory, put out to pasture in the Chase Avenue "boneyard" waiting for the scrapper's torch. George Silcott is seen in the distance. Photo by Alex Campbell taken ca. 1957. By the 1950's the old Cleveland, Akron & Columbus Railroad's Chase Avenue Yard in Columbus had long been replaced by a larger CA&C yard further to the west. Rather than a yard for freight cars it was used to store steam locomotives. It was located on the east side of the shared CA&C/N&W line that ran between the Pennsy's Grogan Yard and the N&W's Joyce Avenue Yard to the north and Columbus Union Station to the southwest. It was also adjacent to the Pennsy's St. Clair Avenue engine house which played a big role in the use of the Chase Avenue Yard for storing locomotives. At the Ohio Railway Museum we referred to this yard as the boneyard. I don't know what the real railroaders called it. The 1950's were the expansion years at the ORM when we were building track extensions on the west side of Proprietors Road in Worthington and expanding the yard area. We were given track donations by the Pennsy and sometimes they came from unused sections of the Chase Avenue Yard. We would borrow a truck and spend a Saturday taking the track apart, loading rails, ties, angle bars and spikes on the truck and taking it to Worthington. 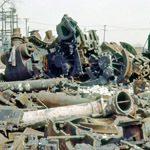 Most of the locomotives stored in the boneyard were in a variety of disrepair. As the Pennsy replaced steam with diesels, steam operation wound down across the Pennsy with Columbus being one of the last places to operate steam. Steam locomotives required extensive heavy maintenance that could even include completely dismantling the engine or boiler and rebuilding what became almost a new locomotive. When this had to be done was dictated by government regulations and was determined by how long the locomotive had gone since the last "class" repairs, as they were known. At the end of the steam era the railroads did not want to do any unnecessary class repairs. The railroad was also subject to seasonal traffic fluctuation and there were times when serviceable locomotives were temporarily stored at Chase Avenue as well as Spruce Street. 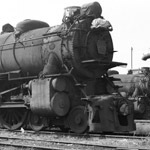 In the early 1950's serviceable passenger locomotives were also stored at the Spruce Street yard. These locomotives would be prepared for storage by covering windows, the stack, appliances and the headlight. 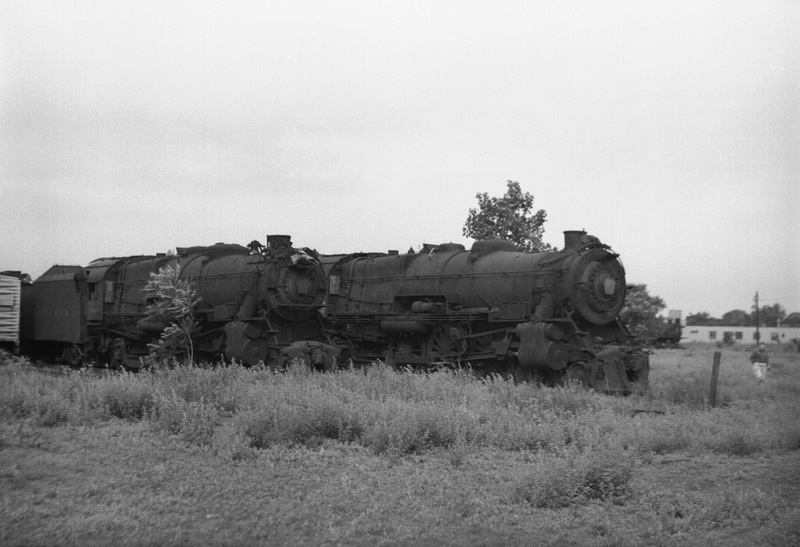 What fascinated me about the boneyard was that you could find locomotives belonging to classes, such as the K-4, M-1 and B-6, that were no longer used. These were locomotives I had never seen in operation. You could pretty much climb all over them without anyone chasing you out.